A few days ago I snapped a few informal pics of the Fall foliage colors on some of my L83 hybrids. Then last night a friend sent me photos of some of his R. rugosa Fall foliage, and those were quite spectacular. So, that prompted me this morning to collect a few nice leaves and take them into the "studio" and do proper pics. 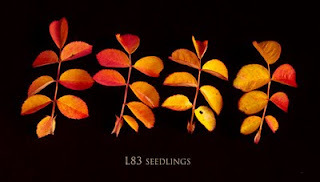 The first image shows a group of L83 seedlings, several of which displayed very rich yellow coloring, and a few had good reds as well. 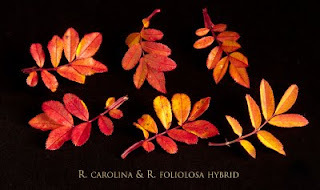 The second image is a selection of leaves from R. carolina, which typically puts on a brilliant Fall display. The one leaf at lower right in the. R. carolina image is a first generation R. foliolosa hybrid (R. foliolosa X 'Little Chief', in fact) and this cultivar always produces great Fall color. Normally my plants of the F2 'Basye's Amphidiploid' hybrid produce excellent Fall color also, but this year they haven't done as well. Most of the garden is not coloring particularly well, in fact, likely because we have had only one mild frost so far.